Canon zoom lens; photo credit: Morguefiles. Kylie Millar (self portrait). My guest this month is 27-year-old Kylie Millar who was born and bred in Cornwall, England, and, though she now finds herself in Thailand, just like me, she remains proud of her Cornish heritage, having branded herself on her travel blog as Cornish Kylie. Not only that but Kylie informs me that the Cornish were granted official minority status earlier this year. Being born and bred in Cornwall now means, technically, that a person is identified as Cornish first, British second—with the latter identity being confined largely to one’s passport. Well, it is true that Cornwall was its own Celtic nation before the Norman Conquest, and they have their own language, Kernewek, which is distinct from Welsh. After the Scottish vote for independence, can a bid by the Independent Republic of Kernow be far behind? Hi Kylie. It’s good to see you at the Displaced Nation. As the name of your blog implies, you are a proud Cornish lass—rightly so! You have also travelled a fair bit. But since Cornwall is a place close to my heart, can you reminisce for a bit about your childhood in that part of the world? I was born in Truro, the main hub of Cornwall, which has a cathedral and is therefore designated a city as opposed to a town. But I was raised in the hilly seaside town of Falmouth, known for its lovely beaches, fishing port and docks. To some, it may seem like an aging coastal town, but the recent influx of art students to its expanding university has given it a new lease on life and a nice arty vibe. My dad is a fisherman so I grew up living a typical Cornish life: summers on the beaches, the smell of a crab being boiled on the stove top (which to this day I cannot abide—the curse of being a fisherman’s daughter and not liking fish or seafood!). But I really do appreciate how lucky I am to have grown up in such a wonderful place and fully intend to return one day. As you know I spent my last year in the UK before emigrating to South Africa (1994/5) in Falmouth, so it’s interesting to hear about the changes. How long after I left did you spread your wings and start travelling abroad? I actually didn’t spread my wings all that much growing up. Family holidays consisted of trips to Butlin’s holiday camps and a few package holidays to Tenerife, in the Canary Islands. I didn’t even move away from Cornwall to go to university, I just commuted the 75 miles east to Plymouth. Why would I want to move away from somewhere like Cornwall? I agree. It’s a magnetic place even for those of who weren’t born there. Carry on, please. As part of my degree I had the opportunity to go to China for a few weeks to do a little bit of English teaching and a cultural exchange with Chinese university students. This was my first time to experience a culture completely different from my own. I was only 19 and in a constant state of “culture shock”. It wasn’t until after I completed my degree and had a few years’ work under my belt that the urge to explore really kicked in. Please tell me a little more about your travels. Aside from the trip to China, I have holidayed in Egypt and Morocco. Then my next big trip was a month backpacking around Thailand with one of my best friends. That’s how I first caught the Thailand bug. You certainly don’t intend to let the grass grow under your feet, Kylie. I foresee you becoming a seasoned traveller before long. I know there is a lot more to your story, but let’s start with the reasons that drove you to travel. I’m not a fan of people traveling purely to “find themselves” or even to “make the world a better place”. Actually, I have changed a lot since coming to Thailand, and I’m sure that, as a TEFL teacher, I’m contributing in some small way to the education of Thailand’s future leaders. But that’s not the sole reason I came here. I had a job in the UK that I loved, but I sensed I was stagnating. So I followed my instincts (very scary but it felt right) and quit, upped sticks and came to Thailand, got a TEFL certificate and started teaching English to Thais. You say you’ve got the Thailand bug, which in my experience can be difficult to explain to anyone who hasn’t lived here. So let’s leave it at that and talk about where, precisely, are you right now and what are you up to. I spent my first 18 months living in the city of Hat Yai, in southern Thailand, near the Malaysian border. I was teaching English at a government high school, with classes of fifty students and few resources apart from those I conjured up myself. Later I went to Phuket, Thailand’s largest island, to work as a teaching assistant in an international school. The two posts and their locations were poles apart. Can you say a little about that for the sake of readers who don’t know Thailand? In Hat Yai I was one of a handful of farangs (Caucasian foreigners) living in a village on the outskirts of the city. On my daily commute to the school, I would meander through rubber plantations, passing water buffalo. At first people would stare, but their stares quickly turned into smiles and shouts of “hello!”. Nobody spoke English beyond that one word, so I had to learn to speak Thai very quickly to be able to order food. In Phuket, by contrast, I am one of thousands of farangs and when Thai people see me they assume that I am a tourist and treat me accordingly. It’s harder to win over the locals here because tourists are their meal ticket. You have to convince them that you aren’t a tourist; you live here like they do. That said, life in Phuket is a lot easier. It has familiar things like pizza and sandwiches (I haven’t got used to eating rice three times a day yet). And of course the island’s beaches are stunning, which reminds me of Cornwall and makes me feel at home. Ah, I think I detect something of the home bird in you, alongside the intrepid traveller… And now let’s see some of your favorite photos and hear the stories behind them. When I was in the Atlas Mountains of Morocco, I couldn’t resist taking pictures of the many beautifully decorated doorways. This picture was accidental as the boy emerged from the doorway just as I pressed the shutter release. Then I realised how people can add an extra dimension and started to include people in more of my photographs. 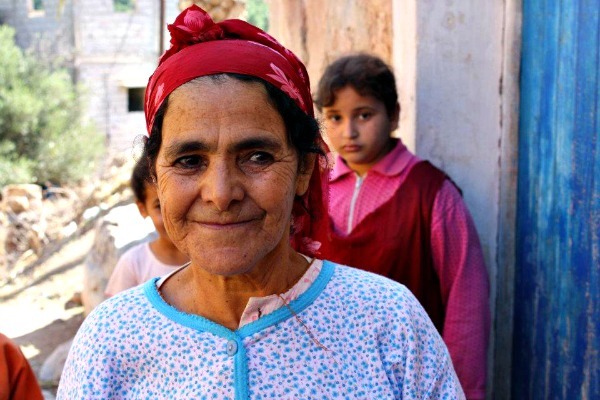 This trip to Morocco was special: it opened my eyes to a very different part of the world. 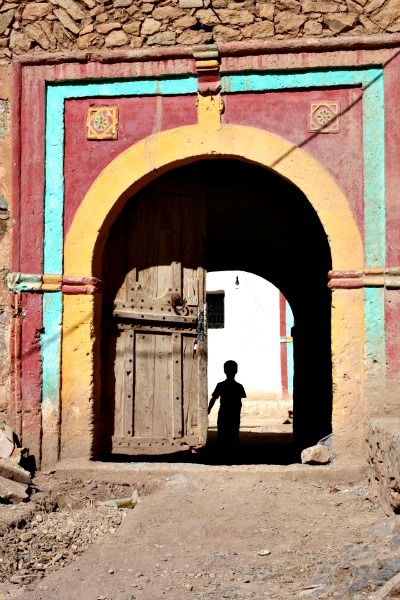 A boy in a Moorish door; photo credit: Kylie Millar. I love this. Dirty, dusty, old and full of intrigue. A great shot. What else do you have for us? 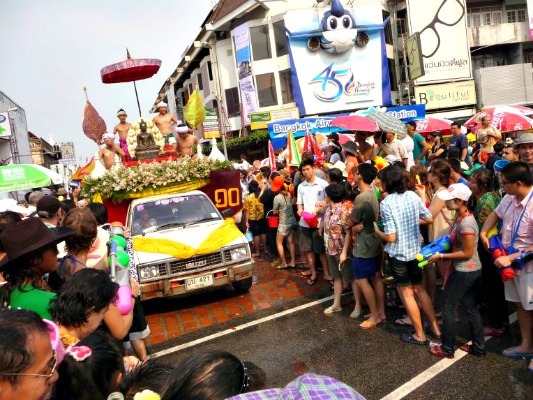 Songkran is the festival held in mid-April to celebrate traditional Thai new year’s. It’s probably the most famous of all the Thai festivals because it’s the scene of the world’s biggest water fight. Determined to join the festivities, I locked away my main camera and went out to the streets. I got this shot when the water fighting stopped to let a convoy of vehicles, carrying Buddha statues, pass to the temple. Songkran is absolutely insane, and if you ever find yourself in Thailand at this time of year, prepare to get wet—or hide! Happy New Year, Chiang Mai style; photo credit: Kylie Millar. And here’s one more of Thailand. As you know, anti-government protests took place from November 2013 through May of this year. I live close enough to Bangkok that I was able to come in and take photos. Having a big camera was useful as it made it obvious I was an observer, not a participant. Foreign involvement in the protests was a big no-no. On the day I took this shot, anti-government protesters had made progress, spirits were high and the atmosphere was unlike any other I have experienced. People were happy to have their picture taken, and this lady was my favourite, standing proudly in traditional yellow to signal her support for the King. For some reason, the scene made me think of the crowd around the Pyramid Stage at the Glastonbury music festival in England—not what you’d expect at an anti-governmental protest. I’m glad I was able to see it all firsthand. 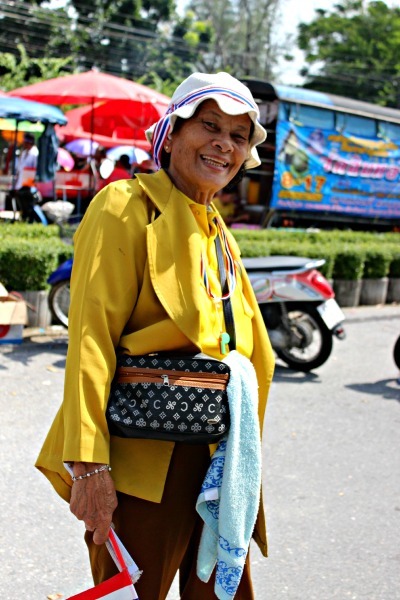 A sunny presence at the Bangkok protests; photo credit: Kylie Millar. 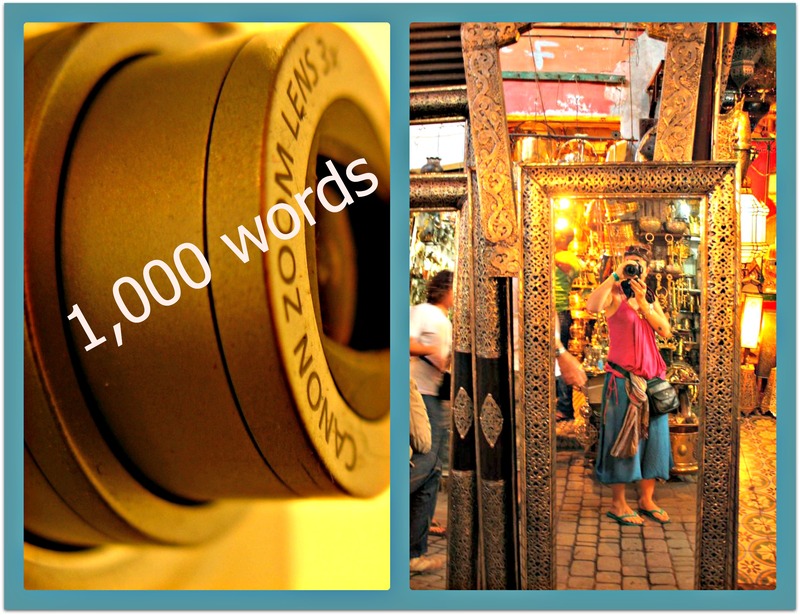 Now could you show us the kinds of places that tend to bring out your shutterbug instincts? 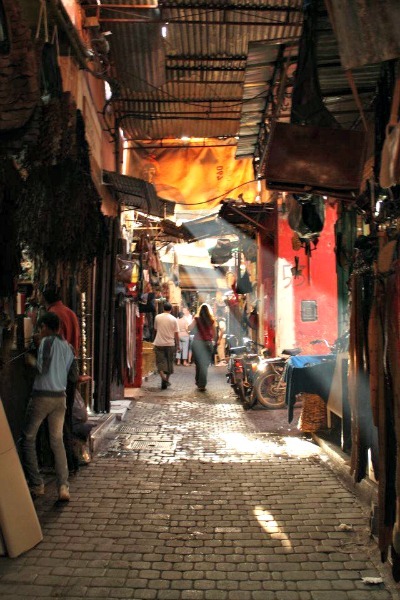 The wonders of the Marrakesh souks; photo credit: Kylie Millar. You captured the smells as well as the intrigue. Well done. What’s next? 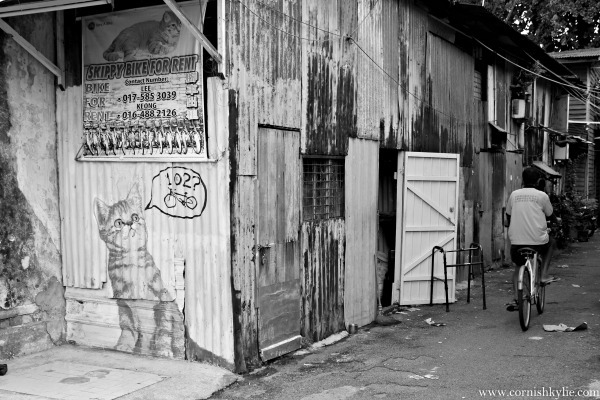 The back streets of George Town, Penang; photo credit: Kylie Millar. I’m not generally a fan of black-and-white photos but this subject lends itself so well. And finally? 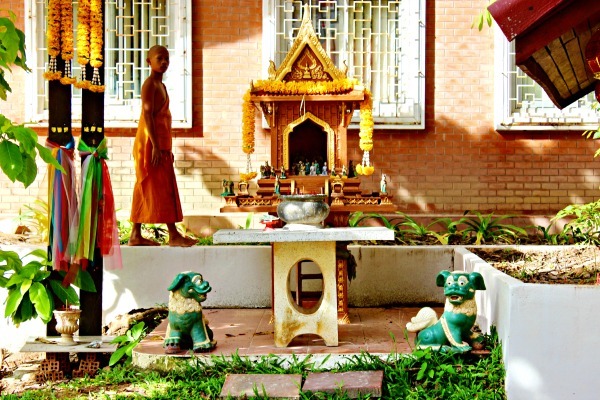 A novice Thai monk and spirit house; photo credit: Kylie Millar. I like the way you captured Thailand’s vibrancy. Tell me, do you feel reserved about taking photos of people, particularly when they are conscious that you are doing so? Actually, I like to try and get natural photographs without the person knowing at all. I want to capture moments and events not someone posing. People generally enjoy having their picture taken, so if they spot a camera they will smile or pull a face and the obligatory peace signs come out. Not quite what I’m looking for… Driving an old banger of a car helps because Thais will sometimes take our picture—because we farangs are assumed to be rich and usually drive smart cars. It can be annoying, this Asian misconception that all Westerners are rich, but I guess we all get used to it in time. So you don’t ask permission unless you need to before taking people’s photographs—but how do you get around any problem of language? If I am unable to be stealthy, then I use the universal “can I take a picture?” sign consisting of pointing to my camera. I have learned how to ask in Thai but the words sometimes escape me. The big camera is usually a clue! When I was in a mountain village in Morocco, getting some shots of the decorative doors as mentioned above, an old lady smiled at me and gestured that she’d like to have her photograph taken. As I released the shutter button, she held out her hand, demanding payment. Not wanting to cause a scene, I forked out some change. Although not too happy with my offering she took it—if only she knew I only wanted a picture of her back door, not her face! People shots for a price; photo credit: Kylie Millar. Would you say that photography and the ability to be able to capture something unique that will never be seen again is a powerful force for you? My mum always says that I take so many photographs but I am hardly ever in them. And that is very true. I know that when I am older I will wish I had more pictures of myself having adventures. But for now photography is a means of capturing what I see and feel. If I think the photos are worth sharing, they will end up on my blog. Photography is changing with the times, though. When I studied A-level photography we used film, processed by hand after spending hours in the darkroom. Filters had to be slotted into the machine; now they are just options on an iPhone app. When my mum was younger she went on a trip to Israel and Jerusalem, and she has two rolls of film from that trip—around fifty photographs. Nowadays people will take more than fifty photographs on a single night out. The technology has evolved so much that nearly everyone has a camera in their pocket on their phone, which is great. It makes photography more accessible to all, with no wasted film. But it does mean that photos are not so special and precious as they once were. Some of our readers may want to know what kind of camera and lenses you use, as well as any post-processing software. I’ve got a Canon 600D with standard lens, and a 75-300mm telephoto lens (perfect for those stealthy pictures of people, and for animal shots). I’ve also got a Panasonic Lumix point and shoot for the days when a bigger camera isn’t practical. If I am going to edit, I use Adobe Lightroom, which I am still finding my way around. Having never been taught how to use digital post-production software, I have to rely on trial and error—but that was also what it was like in the darkroom. It’s more fun that way! Take more pictures than you think you need. Bring spare SD cards and back them up—you will lose one or one will break. Don’t keep your camera locked away in a bag, keep it to hand, it needs to become a natural extension of yourself, not this big cumbersome thing you have to get out every time you want to take a picture. Even though we are more than 40 years apart, we both left Falmouth and ended up in Phuket with the same camera (Canon T3i 600D). No wonder your pics are so good! Thank you for taking the time to tell your fascinating story. Readers, what do you make of Kylie’s experiences and her photography advice? And do you have any questions for her about her photos or her travels? Please leave them in the comments! And don’t forget you can follow Kylie on her blog, Cornish Kylie. You can contact her by email at info@cornishkylie.com, and you can also find her on social media: Twitter, Facebook, and Instagram. If you enjoyed this post, we invite you to register for The Displaced Dispatch, a round up of weekly posts from The Displaced Nation, with Alice nominees, exclusive book giveaways and other extras. Register for The Displaced Dispatch by clicking here! This month’s A picture says… is all about little old me! Head over to TDN to check it out and more. Happy Friday everyone!